In the InLoox PM options you can define, which subfolder will be displayed on the Documents page by using file storage feature. 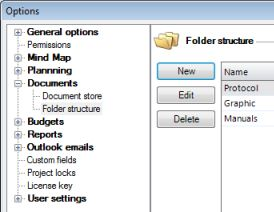 InLoox PM 7 allows subfolders to be created automatically in each document folder of a project. These subfolders are created new as soon as a user selects a new project folder on the Documents page. As many subfolders as required may be created automatically in a hierarchy structure of any depth. For more information see Create and change the document folder path. Insert a new subfolder by clicking New. In the New Subfolder dialog box type a new name, e.g. Marketing. Click OK.
InLoox PM creates in each project document folder a subfolder named marketing. Remove a subfolder from InLoox PM by clicking Delete. How to create a document sub-folder | InLoox PM 7 • Copyright 1999-2019 © InLoox, Inc. All rights reserved.